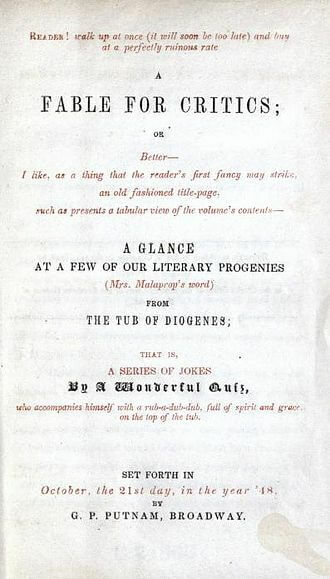 A Fable for Critics , subtitled, "A Glance at a Few of Our Literary Progenies" was one of Lowell's most popular poems, a book-length farcical literary satire directed at popular American authors, including Ralph Waldo Emerson and James Fenimore Cooper. He includes himself in his mudslinging, describing Lowell as having difficulty determining the difference "'twixt singing and preaching." First published anonymously in 1848, Lowell's authorship is revealed in the subsequent editions. Recently released on Amazon, Rob Velella 's updated edition with typo corrections and new footnotes: A Fable for Critics: The Original 1848 Satire. Return to the James Russell Lowell library.